You can get a medical aid quote in South Africa via the internet. Depending on the option you select you will either receive a no-obligation comparative quotation by return email, or an expert medical fund consultant will contact you by phone to discuss your requirements. Those giving a medical aid quote are in a position to give good advice about the various medical schemes and hospital plans. In addition to a medical aid quote you have the option of receiving information about gap cover offers as well. When comparing medical aid quotes you should remember that there are two distinct kinds of health cover in South Africa. You can get a full explanation of these two kinds of medical cover below the form. Medical Aid Schemes. These medical funds are all registered with the Council for Medical Schemes. This means that they are regulated and supervised. These medical schemes must offer certain minimum benefits to members. The list includes nearly 300 conditions, including over two dozen chronic conditions. 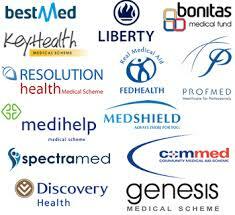 Some of the medical schemes that are open to all South Africans include Genesis, Momentum, Fedhealth and Discovery. They offer full-blown medical plans and hospital plans. Please note that it is illegal to belong to more than one scheme at a time. Insurance Companies. These are businesses and not schemes. They are in it for the profit, whereas the medical schemes are non-profit organisations. South African insurance companies, which include giants like Old Mutual, Liberty and Sanlam are not governed by the Medical Schemes Act in the way that medical funds are. Therefore they do not have to offer treatment for the long list of Prescribed Minimum Benefits mentioned above. Be aware of this when getting a hospital plan quote from companies like Clientele. Hospital Plans. Even if you require a small amount of hospital cover you should really sign with a medical aid scheme rather than an insurance company. You are automatically then covered for a huge number of treatments in terms of the rules about Prescribed Minimum Benefits or PMBs. There are super hospital plans available from the major medical aids such as Momentum, Genesis, Bonitas, Discovery and Sizwe. Medical Aid. There are two distinct types of medical aid schemes, namely open schemes, which any South African may join, and restricted schemes such as Bankmed and GEMS, which are for those employed in specific industries (banking and the government in these two instances). The major open schemes include Discovery Health, Selfmed, Bonitas and Genesis. Coastal deals. If you live at or near the coast of South Africa then look out for special deals. It has been proven actuarially that people who live near the coast are healthier than their inland compatriots. Demand discounts on medical aid or hospital cover if you are fortunate enough to live at the coast. Pregnancy and medical aid. Ideally you should sign up for medical aid long before you plan to start a family. This is because most medical schemes have a twelve month waiting period before they will cover a woman for medical expenses related to pregnancy and childbirth. This is to prevent abuse of the schemes. The good news is that even if you sign up while pregnant, many medical schemes will cover the baby’s health while it is in hospital just after childbirth. Expected hospitalisation. The great thing about medical aid legislation in South Africa is that all open medical aids are obliged to accept members no matter what their health status. Therefore you cannot be turned down. It is worth getting comparative medical aid quotes no matter if you are expecting to need specialist care or hospitalisation or not.